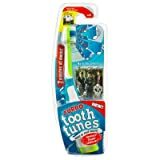 I gotta say, Tooth Tunes from Hasbro, has been a big hit in our house. At first, my wife scoffed, but these toothbrushes really are a good incentive for little brushers, like my 4-year old boy. The cool difference is that they play music through vibrations through the bristles which makes it sound like music going on through your teeth and into your ears. The songs they have are a little hokey, like “Waking (originally Making) up is Hard to do,” by Neil Sedaka, but others are by more recent teen brushers, like the Jonas Brothers and Miley Cyrus.